Building a deck is an investment, so you’ll want to get it right from go. Fortunately, our design team—the very same stylish crew who introduced Decking & Railing Duos—chose the best decks to go with all kinds of homes. Have a read and then start sampling. It’s hard to find a deck that doesn’t look great against a quarried palette of grey, taupe and caramel. Difficult as it was, our stylists chose two frontrunners: Trex Transcend® in Havana Gold and Island Mist, two tropical-style composites that mimic stone’s interesting ebbs and flows of color. The honeyed tones of Havana Gold complement its warmer streaks, while the silvery, driftwood-inspired allure of Island Mist puts a contemporary, dune-side spin on stone’s bluish slates and sandy ivories. Over 32% of new homes in the U.S. feature some form of vinyl siding, and it’s easy to understand why. Vinyl provides homeowners with a durable, low-maintenance option that keeps both heating and cooling costs down. For homes with horizontal vinyl panels in a classic tan, our design team recommends Trex Enhance® in Clam Shell as well as Trex Select® in Woodland Brown. Clam Shell brings a not-like-the-Jones modernity to an exterior often found in suburban developments, while Woodland Brown’s umber depths add a luxe, reading-room feel that evokes stately heritage. Dating back to Colonial times, shakes have a handsomely rugged and rustic appearance that recall summers spent on New England shores. In complement to their old-Americana patina, our design team recommends sampling both Trex Transcend in Tiki Torch and Trex Enhance in Clam Shell. Tiki Torch tugs on the sun-dappled tones of weathered shakes, with its hints of nutmeg and ginger. The matte oomph of Clam Shell, on the other hand, grounds shakes in a deep sea of modern grey—perfect for a clean, streamlined look. From the sweeping center hall colonials of Charleston to the charming craftsman bungalows of Portland, brick homes of every size and style have endless curbside appeal. Not only is brick a clean, natural material, but it also absorbs sound and resists fire, serving as a terrific form-meets-function choice. To tease out its range of burnished red and brown shades, our design team recommends Trex Transcend in Lava Rock, a durable composite that boasts the hardy, striated appearance of redwood. Likewise, Trex Enhance in Beach Dune—a timeless, everyman’s brown—goes hand-in-hand with classic brick. Close your eyes and imagine the sprawling ranchers of Southern California and O’Keefe’s Southwest; a sunny stucco likely springs to mind. When considering the type of deck that would complement stucco’s painterly, midcentury allure, our design team went with a pristine, stony grey—Trex Transcend in Gravel Path—to keep the palette airy, elevated and chic. 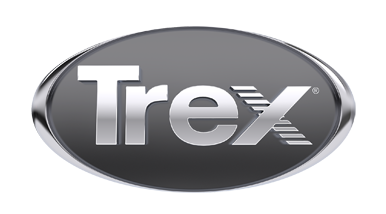 In contrast, Trex Transcend in Spiced Rum, is a rich, tropical-inspired umber that adds soul and gravitas.